A local event was put on at The Canyon Club to benefit Pat “Paraquat” Kelley in his fight against MS.
Paraquat is a legendary DJ from the rock FM station KMET. For most anyone who is 40 or older that grew up in the L.A. area, just hearing his name mentioned brings back the memories of the station to a time where KMET was to KLOS what TicketTron was to TicketMaster. “The Mighty Met” signed off in 1987 during a time where “people paid for music and television was free”, as was stated at the event… “and now it’s the other way around”. Attendees swapped stories and a very cool silent auction was held. It was a great experience for all the Paraquat Kelley fans that were there to honor him. All kinds of memorabilia ranging from guitars signed by The Eagles, Styx, Richie Sambora, Orianthi, Slash’s top hat and many great collectible pieces. The beginning of the show was acoustic, the middle was rock and it ended in “K-METAL”, as Chas West would mentioned later on in the evening. DJs Jim Ladd Jeff Gonzer, Ace Young, Cynthia Fox and many others were in attendance for the event. The acoustic portion included narrator/ host “Walt Whitman” (John C. Slade) Paul Barrere and Fred Tackett, Michael Ann Azoulai, Kiki Ebsen , Janiva Magness, Dan Navarro and many more. 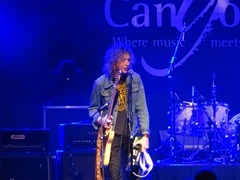 Peter Stroud appeared to be the musical director and the one that kept the show going. His playing was phenomenal throughout the show. The conclusion of the acoustic portion saw Jim Ladd introducing George Thorogood. He talked about calling George to participate in the event and how George was able to confirm his attendance. Halfway through his set, Slash hopped onstage and jammed two songs and that marked the end of the acoustic portion. Jeneva Magness kicked off the electric part of the show The next band featured guitarist Waddy Wachtel, bassist Prescott Niles from the Knack, and drummer Curt Bisquera (“Kirkee B”) were joined by Jaimie Savko and played The Immigrant Song, Highway To Hell and Werewolves of London. Julian Shah-Tayler sang Rebel Rebel, Christina LaRocca joined for I Hate Myself for Loving You and they finished with a jam of It’s Only Rock N Roll .. and everyone liked it. Angeles closed out the show. It was an outstanding event and will hopefully be a big help to Paraquat Kelley and his family.